Julia Fox, Jane Boleyn. The Infamous Lady Rochford (London 2007). Brandy Purdy, The Boleyn Wife (New York, 2010). Jane Parker, or to use her more recognisable name Jane Boleyn, is one of the minor player in the great drama of Henry VIII second marriage to Anne Boleyn. Jane was Anne's sister-in-law, wife of her brother George Boleyn, Lord Rochford. Like Anne Boleyn, Jane was a lady-in-waiting of Catherine of Aragorn and kept this position under Henry VIII's four subsequent wives. Jane survived the spectacular fall of Anne, her brother and various other members of the court. Only when she was heavily implicated in the extra-marital adventures of Catherine Howard Jane's luck ran out and she was executed with her mistress on 13 February 1542. As she is said to have been one of the key-witnesses in the case against Anne Boleyn, her death has often been seen as a highly deserved come-uppance. In the last couple of months I have read two books about Jane Parker, Lady Rochford: Brandy Purdy's novel The Boleyn Wife and Julia Fox's biography Jane Boleyn. The Infamous Lady Rochford. My interest in Jane Parker - and also the reason why I keep referring to her by her maiden name - actually does not stem from any particular interest in the Tudor period in general, or in Henry VIII's marital adventures, or even in Anne Boleyn, but from my interest in the family of her grandmother Alice Lovell, mother of Jane's father Henry Parker, Lord Morley. Alice Lovell was the daughter of William Lovell, Lord Morley, the uncle of Francis Lovell and a younger son of the Lovells of Titchmarsh, the family I wrote my DPhil thesis on. For me, Jane Parker is interesting by herself, without any reference to the Boleyns. Though, of course, without this connection, there would probably not be any books to read about her. A few words should here be given to explain Jane Parker's family background: Alice Lovell, daughter of William Lovell and Elizabeth Morley, married a knight named William Parker. On the death of her brother Henry Lovell, Lord Morley, she inherited the Morley barony. Hence her son was Henry Parker, Lord Morley. Alice Lovell married as her second husband Edward Howard, a younger son of the duke of Norfolk and uncle of Catherine Howard. 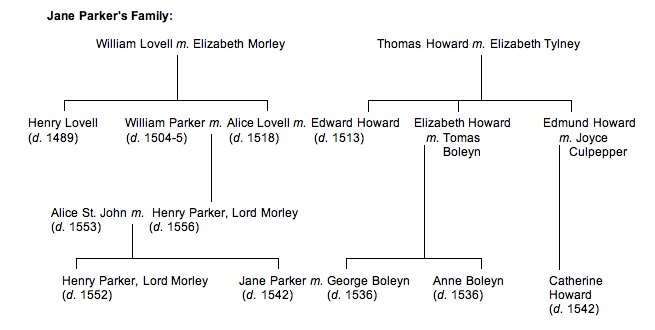 Edward Howard was also the uncle of Anne, Mary and George Boleyn, children of his sister Elizabeth and Thomas Boleyn. The higher nobility was one big family, all related to some degree by marriage. As in many extended families their relationships were however often dominated by bickering and jealousy. 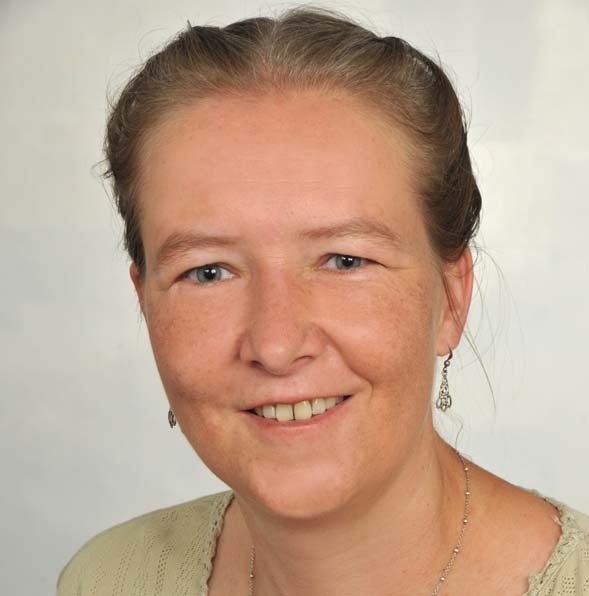 The fact that most people are interested in Jane Parker because of her closeness to the Boleyn family is made clear by the fact that both books, the novel and the biography, have that name in their title. In fact, Brandy Purdy published a novel on the same subject a few years earlier, in 2007 (available from Books on Demand) that also includes this particular key word in its rather unwieldy title: Vengenance is Mine: A Novel of Anne Boleyn, Katherine Howard, and Lady Rochford - the Woman who Helped to Destroy them Both. I was about to say "talk about giving away the story in the title" but then most people who will pick up the book will do so because they already know what happened and the role Jane Parker/Boleyn played - or is said to have played - in the drama and just want to read more about it. The second point that both books have in common is that the reader learns a lot more about Anne Boleyn, Henry VIII, and his first, third, and fourth wives and about life at the Tudor court than about Jane Parker. It may be that the authors thought this more interesting, or that they wanted to present the story in its entirety, or that they thought it better not to expect their readers to be familiar with the events. The main reason for this phenomenon is no doubt that there simply are not enough facts known about Jane Parker to fill an entire book. Be that as it may, for me this was, if not completely unexpected, a little disappointing. In one point the books differ enormously, and I do not mean that one is a novel and the other is a biography: the way they depict Jane Parker herself. While Brandy Purdy fully subscribes the version that Jane deliberately betrayed her sister-in-law and her brother, Julia Fox tries to exonerate her from this crime. Obviously, as a novelist Brandy Purdy's job is it not to discuss a variety of possible scenarios or address uncertainties about what might have happened, but to imagine one way in which the event unfolded, put herself into the position of the characters, show and explain their motivation to the readers, and create a believable world the people in the story inhabit. So, fair enough, Ms Purdy goes with the version in which Jane Parker is the woman 'who destroyed' both Anne Boleyn and Catherine Howard. This said, I found The Boleyn Wife rather disappointing. The motivation the author gives her central character is not only rather predictable, over the entire length of the book it does not change at all. Perhaps I have too high expectations of historical novels, but should there not be some character development? Some dynamics between the main character and the other characters? Reading the same feelings expressed over and over and over again becomes quite boring after a few hundred pages. The main character in any story does not have to be "nice" or "good" to be likeable, fascinating or understandable, but Jane Parker's character is, sadly, none of these things. To me at least Jane Parker came across as simply psychotic. I am not sure the author intended it this way, judging from the 'Questions for your Reading Group', I don't think so. Speaking of these questions, the last question rather set my teeth on edge. The readers are asked whether having now read Jane Boleyn's story 'in her own words' has changed their opinion on her. I beg your pardon, but I haven't read Jane's story 'in her own words', but in the words of Brandy Purdy. If it changed my mind about anything it was that I wanted to read something from the non-fiction section to find out more about Jane Parker aka Lady Rochford. Apart from piecing together the story of Jane Parker's life as far as is possible, the author also adresses the question how and when Jane acquired the reputation as having been responsible for the death of her husband and sister-in-law. This is, in my opinion at least, one of the most interesting parts of the book and very convincingly argued. The one thing that I found rather irritating is that considerable sections of the book read more like a novel than a biography. If no evidence is found, Julia Fox simply imagines what could have happened. It is very probably that many readers, possibly the majority of them, find this enlivening the narration, I, however, constantly mutter to myself, "you cannot possibly know this! It might have been completely different! Is this a novel or a biography??" Whether or not one takes to this style of writing is a matter of personal taste, of course, but I incomparably prefer it when uncertain or unknown facts are addressed as such, when a book is either a work of fiction or a fact-based study. I always end up thinking, if you want to speculate why not write a novel? We do not know whether Jane Parker was in love with George Boleyn when they married. She may have been happy, she may have been indifferent, apprehensive or resigned. She may have detested the very sight of him (though her father seems not to have been the kind of person who would force his daughter to marry somebody she hated) or she may have been in love with somebody else altogether. To bring this long rant to something of a conclusion, I would advice anybody who is interested in reading about Jane Boleyn, née Parker, Lady Rochford, to get ahold of Julia Fox's biography, which is easy to read, well researched and provides, as far as I can tell, as much information about her as we can know.